The "city of lakes' is perhaps the most romantic and beautiful cities of India. In contrast to its neighborhood it stands out with an enchanting image of white marble palaces, placid blue lakes, gardens and temples surrounded by hills and mountains. 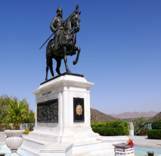 It was founded by Maharana Udai Singh in 1559 A.D.on the shores of lake Pichola. 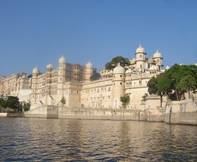 The most striking landmarks of the city are the City Palace and the Lake Palace.Udaipur is the most colorful city in Rajasthan. Festivals and celebration, music and dance punctuate its barrenness.Udaipur, not only the city is lovely and full of tourist places, city around also offers some of worth visiting places in vicinity. Udaipur is a part of royal Indian state of Rajasthan, extending from latitude 27°42' in the North to longitude 75°33' in the North. History dates back to Maharana Udai Singh whoc was the Sisodia ruler of Mewar and it was he founded the city of Udaipur.But soon they were facing trouble from the Mughal invaders who were trying to take them antagonistic and to send them out of India. The Sisodias did not wanted to become a subservient to the Mughals nor did they wanted to make any alliances to fight with the Mughals.The war started when Babar wanted to defeat Rana Sanga of Mewar and make himself firm in India.But however it came to an end when Akbar defeated the Sisodias and Chittorgarh was destroyed by force to shift their capital to Udaipur, and remained the headquarters of Mewar till Indian independence. This festival falls in the month of March to worship Lord Shiva and Parvathi.Women wear traditional Lehanga-choli and take part in dance. The procession to Pichola Lake is the highlight of the Gangaur festival in Udaipur. The ceremony attracts a number of tourists and locals. The whole event comes to an end with the display of wonderful fireworks on the bank of Pichola Lake. This is one of the important festivals of Jaipur which heralds the advent of monsoon. Ladies enjoy swings while singing traditional teej songs. Rope swings are decorated. Women wear exotic colourful dresses. Idol of Goddess Parvathi is also worshipped. Married women's give a plateful of sweets and fruits to their mother in laws, which are called Vaina. This festival falls in the month of March-April during which goddess parvati is worshipped.The main eve of the festival is women carrying images of the goddess to the Gangaur Ghat of the Lake Pichhola in a colourful procession by singing and dancing. 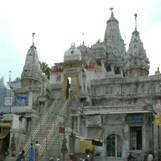 This is a right temple to visit if you are very much inquisitive of knowing more about the mythical tales of India.This temple is situated just a few kilometres away from the city and attracts most of the spiritual minded people coming to the city. Apart from the spiritual value of the temple if you are interested in looking for scenic beauty then the Kankroli Temple is the right temple. Situated in the lakes of Pichola and incorporating the majestic Gangaur Ghat,this Haveli was built in the second half of the 18th century by the then Prime Minister of Mewar.Every evening at 7 p.m. a cultural program is organized especially for tourists called DHAROHAR.At present it is a cultural museum and is a part of the west zone cultural centre. This place s also referred by the name Moti Magri.An impressive bronze statue of Maharana Pratap on his horse Chetak stands at the top of Moti Magri overlooking Fateh Sagar.Local people climb the hill to pay homage to Rana Pratap and his faithful charger 'Chetak', who was killed in the battle of Haldighati. This is the largest palace complex in Rajasthan,construction of which was stared by Udai Singh.This white marble architectural marvel,standing majestically on a hill is surrounded by crenellated walls.This huge edifice 30.4 metres high and 244 metres long was added on to top by later rulers.The entrance to the palace is through Hathi Pol. Better known as the lake palace it is regarded as one of the most beautiful palaces in the world and the mere sight white wonder rising from the turquoise waters of lake Pichola is dream like.It has been called one of the most romantic creations of man.Today Lake palace is a five star heritage hotel. It's like being cocooned in authentic royal luxury at the Fateh Prakash Palace, the grand heritage palace of the HRH group. The warmth of royal hospitality greets you as you walk along the corridors lined with large paintings of the Mewar school that flourished in the seventeenth through nineteenth century. A museum of folk arts,it dislplays a rich collection of folk dresses,ornaments,puppets,masks,dolls,folk musical instruments and paintings.It has a section devoted to tribal art. This fine lake lying to the north of and connected and connected by a small canal with lake Pichola,was originally built by Maharana Jai Singh in 1678 AD.because of excessive rains,the old dam was washed away and Maharana Fateh Singh built the present embarkment. 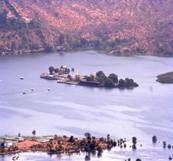 Pichola Lake derives its name from Pichola Village was submerged and Maharana Udai Singh enlarged the lake after he founded the city. He built a masonry dam known as Badipol and lake is now 4 km long and 3 km wide. This picturesque lake encloses the Jag Niwas Island and the Jag Mandir. And, the City Palace extends along its eastern banks. Jaisamand Lake is the second largest lake in India and was built by Maharana Jai Sigh. The lake has elegant step leading to the water and marble Chhatri (cenotaphs) on its bank and a small Shiv temple marks the grace of the lake. On either side are the palaces built for the king favourite queens. This is the older water palace by Rana Jagat Singh in 1620 AD.It is also the place where the European families were sheltered by Maharana Sarup Singh during the uprising of 1857 AD. 'Saheliyon Ki Bari'or 'Garden of the Maids of Honour'was laid out for a group of forty eight young women attendants who accomapanied a princess of Udaipur as part of her dowry.The garden set below the embankment of the Fateh Sagar Lake have beautiful Lotus pools. Originally intended to be an astronomical centre,it later became a monsoon palace and hunting lodge.It affords a breathtaking view of the Mewar countryside. Inspired by rich cutural heritage a captivating collection of exquisite folk toys, bright coloured garments, handprinted textiles, batik and tie and dye sarees and fabrics and silver jewellery awaits the buyer at the shops. The Pichwai paintings or wall hangings of this place are world renowned. The major shopping centers are the Chetak circle, Baapu bazaar, Palace road, and Shastri circle. You can get a large number of interesting articles here that would make fine souvenirs. These include carved stone items, miniature paintings, pottery, silver and golden jewelry, antiques, and colorful puppets. How To Reach Tibetan Market? The city has domestic airport, which is service by majority of airlines. Regular flights connect the city with key Indian cities like Delhi, Mumbai and so on. The nearest Railway Station is located in Udaipur City. Rail network connects Udaipur with Delhi, Ahmedabad, Jaipur, Chittaurgarh. The city is conveniently connected with important destinations of Rajasthan and neighbouring states like: Gujarat, Madhya Pradesh, Maharashtra by extensive road network.